Ann Budge's proposed takeover of Hearts has been completed. The new owner will move into Tynecastle on Monday and hold meetings with staff and players about the future. Hearts' largest creditor, Ukio Bankas - which held a 29.5% stake as well as security on Tynecastle, agreed to sell its shares to Budge's Bidco company. It follows a deal with the bank's parent company, UBIG, to buy the investment company's 50% holding in the Edinburgh club. Budge, a millionaire former IT specialist, has fronted the £2.5m for Bidco, the company that should now take over the running of the club. 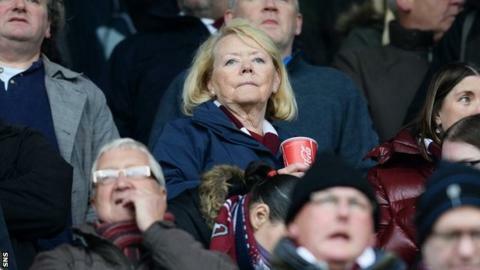 The 66-year-old will become executive chair "on a no-fee basis" and ownership of the club will be transferred over to fan group the Foundation of Hearts within five years. The FoH wrote on its Twitter account: "Four historic words for all Hearts supporters - 'deal done, thank you'." Budge will be joined on Hearts' board by business partner Eric Hogg, Robert Wilson, who was the Scottish Premier League's first chairman, and MP Ian Murray, who will be the foundation's representative. The deal with the fans group was concluded after it made a payment of £1m that will be used to provide the club with immediate cash flow. In addition, it will pay another £1.4m for the first two years and, if all payments are met along with a number of other conditions, the foundation will then be able to take control of 75% of the club. Hearts have been relegated this season and will play in the Scottish Championship next term. Manager Gary Locke, whose contract expires in the summer, has called for his future to be clarified.